We at Bueno Used Cars want to help you be a thoughtful driver. Today, we offer tips on sharing the road as a driver or a cyclist. Behind the wheel, you must leave cyclists at least three feet of open space at all moments. Do not harass cyclists, and only pass when everyone on the road has ample room. People on bicycles have an equal right to the road. A cyclist may use the entire width of your lane, so do not cruise beside them. 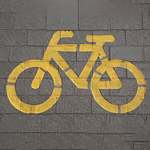 Behind your handlebars, remember that riding a bicycle on the road is not a free pass. Obey every traffic sign. Stop at red lights. Do not weave in and out of traffic. Move in the same direction as cars in your lane. We also urge you to wear a helmet for your protection. Finally, if you ride at night, you need lights on the front and rear of your bike, and you should wear reflective gear.